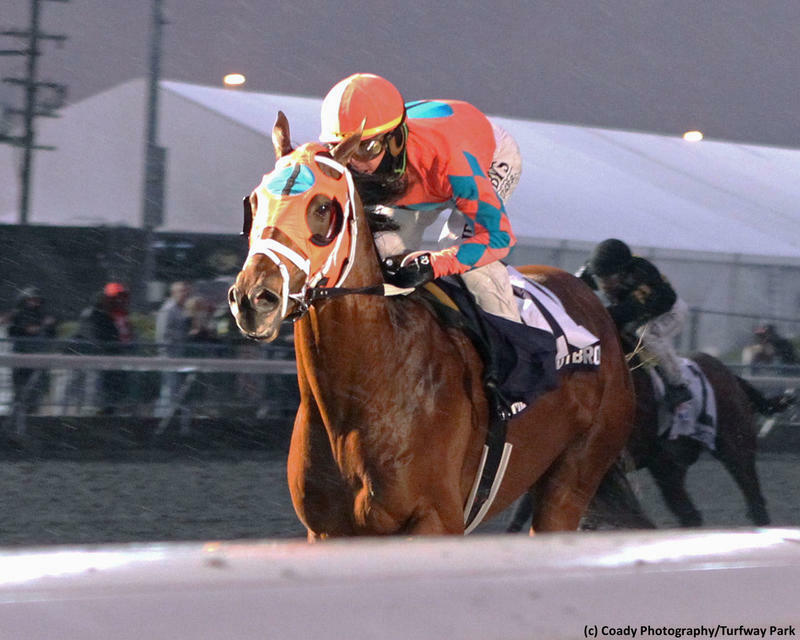 Skychai Racing and Sand Dollar Stable’s Somelikeithotbrown, a son of 2008 Kentucky Derby (G1) champion Big Brown, earned 20 points toward Derby 145 with a victory in Saturday’s $200,000 Jeff Ruby Steaks (G3) at Turfway Park. The well-named Somelikeithotbrown, whose dam is Marilyn Monroan, was sent off as the 3-5 favorite. The Mike Maker trainee was not only proven on this Polytrack surface, after a handy score in the February 15 John Battaglia Memorial, but he had strong form at two. Last season, he placed in a trio of graded turf stakes – the Breeders’ Cup Juvenile Turf (G1) at Churchill Downs, Pilgrim (G3) at Belmont, and With Anticipation (G3) at Saratoga. Somelikeithotbrown flaunted that class in the Jeff Ruby. Five Star General, a 7-1 chance, sped to the lead through the opening quarter mile, but Somelikeithotbrown soon collared him to set the pace with jockey Tyler Gaffalione. After putting Five Star General away, he opened up on the rest of the field. Although Somelikeithotbrown was losing steam down the stretch, none of his rivals could gain enough ground to threaten. The favorite crossed the wire 3 1/4 lengths clear while negotiating 1 1/8 miles on Polytrack in 1:52.05. Dynamic Racer, runner-up in the Battaglia, was second again and took home 8 points. The 59-1 Moonster rallied for third, good for 4 points, and Five Star General received 2 points in fourth. Bred in New York by Hot Pink Stables and co-owner Sand Dollar Stable, Somelikeithotbrown has earned $363,478 from a record of 7-3-2-1. His only try on dirt came in his career debut at Saratoga, where he was a distant seventh in the slop. The bay colt promptly rebounded with an eight-length romp on the turf and has competed in stakes ever since. Somelikeithotbrown hails from the immediate family of champion Stevie Wonderboy, the 2005 Breeders’ Cup Juvenile (G1) winner. Further back in his female line, one finds Big Blue Kitten, the champion turf horse of 2015.